Expect to see more yellow buses around Brighton and Hove, as The Big Lemon has been awarded the contract to run eight subsidised services in the city. The eco-bus company - which runs its vehicles on electric or cooking oil - already runs the number 52 to Woodingdean. But it will also pick up services to East Saltdean, Ovingdean. Portslade, Hangleton and Patcham from this Sunday (September 17). The news was announced by Brighton and Hove City Council this morning (September 14). Norman Baker, managing director of The Big Lemon, said: “We have cleaned up on the council contracts. All of the services at the moment are run by Compass with the exception of the 52. The move means the company will be employing up to 13 new drivers, and will need more buses to add to its fleet. The company currently has two electric buses and one electric mini-bus, charged by solar panels on the roof of the depot in Whitehawk. It has also recently been awarded £500,000 towards three new electric buses. In the meantime the new services will be run with double-decker diesel buses, until new buses can be bought to be converted to electric. Tom Druitt, founder and chief executive of The Big Lemon, said: “Because of the time frame there was not enough time to get electric buses. We were very clear that we are totally committed to electric vehicles for all services, but there would be a six to nine month transition were we would have to run diesel buses as they want the service to start in a week’s time. He said he hoped the company would add three more electric buses to its fleet, making nine in total. “The electric bus on the 52, it works really well,” said Mr Druitt. “It is really quiet, really comfortable. But electric buses are much more expensive than diesel buses, Mr Druitt said, which is why the government has released funding to cover the difference between diesel and electric vehicles. The Big Lemon will be putting £430,000 on top of the government’s £500,000 grant to buy three electric buses, and Mr Druitt said the company hopes to convert a further three diesel buses into electric, taking its total number of electric buses to nine. But despite the price, Mr Druitt said the environmental credentials, and the fact they are cheaper to run make electric buses worth it. The Big Lemon will now run the 16, 16A, 56, 56E, 57, 66 and 67, as well as the 52 which it already runs. 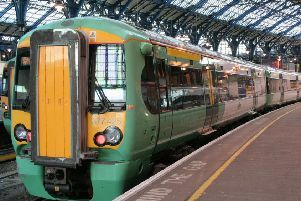 Compass retains the contract for the number 37.